PC <-- TCP/IP --> CSE-H21 <-- Serial --> PLC. To find out whether the problem happens in TCP/IP connection or in Serial connection, we would like to ask for more information. First, please make sure the serial configuration is set properly between the PLC and CSE-H21 device. 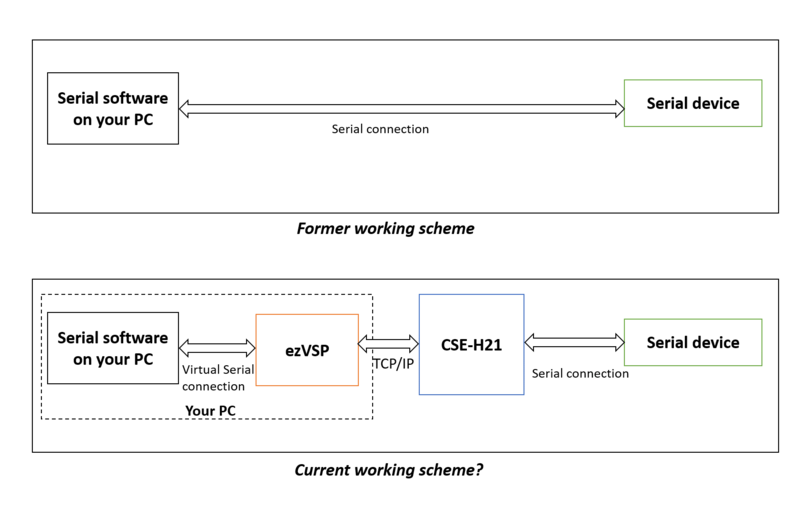 There will be a TCP/IP connection between CSE-H21 and your PC. We guess that your working scheme is similar to the one in the attached photo below. If you still can not find any problem with your setting, could you please send us the screenshot of Serial and TCP/IP setting on your CSE-H21, and also let us know the configuration for the interface in your PC/your PLC with CSE-H21? > I have a problem to connect a Mitsubishi PLC, type L02, to a CSE H21. > The WAN connection online is ok.